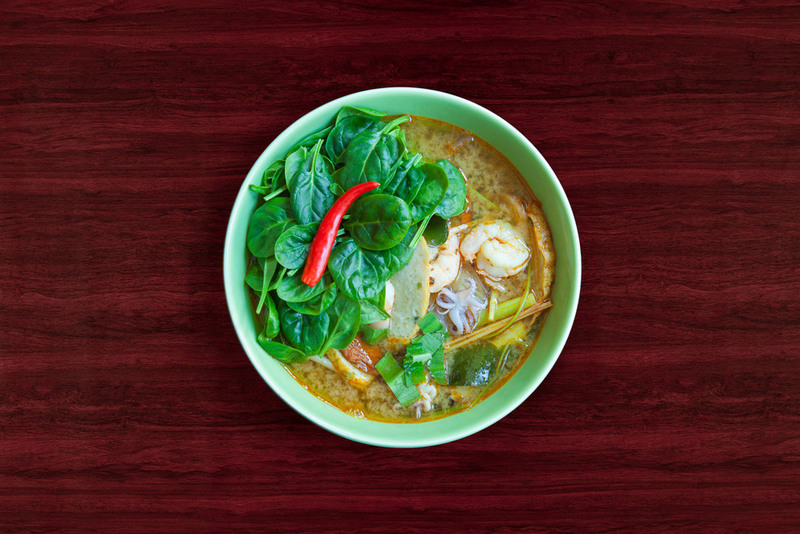 Thai cuisine gets more than just an unanimous vote in our home when we decide to eat out. So imagine our joy upon being invited by Busaba Eathai for a review. The restaurant in JBR, on the Beach is a Thai restaurant chain from London conceived by Alan Yau. The location is perfect, with a laid-back ambiance, however the signage needs a lift (we crawled along the beach, got insanely exhausted and i should add we were lucky to spot the discreet sign). We walked into a fairly empty space- and it deserves to be busy. The friendly servers welcomed and seated us at the new terrace extension, amidst the excitement at the beach. The restaurant boasts of an affordable, casual dining concept. We started our meal off by tucking into a 'Small Plate' set which offers the usual selection of Thai appetizers- chicken satay, crab cakes, pandan chicken, spring rolls and Somtam salad. The stand out on the platter was the Chicken Satay- which is a quintessential Thai starter, but it's often wrecked by restaurants as they spin the routine version on it to the point it becomes boring. Busaba's variant is a sound balance of texture and smokiness, offering a multitude of sensory pleasures. The succulent chicken was paired well with the savory peanut sauce.The friendly manager insisted we try one of the delights of the menu 'Thai Calamari' with ginger and peppercorn: not your usual fare of crispy fried calamari. This was tender and meaty, the seasoning adding a brilliant twist to the flavor. For the main course we had a classic green chicken curry with jasmine rice, Red Snapper with chilli sauce and a Pad Kwetio noodles. The kitchen here, certainly does its job to scratch the Thai craving itch, however if you like your dishes spicy like i do, remember to ask your server for extra hot. The bottle of Sriracha sauce on the table came to my rescue. The menu items served are definitely big enough for sharing. Signet Ring seals: The mango sticky rice dessert -the real reason you should frequent this place is for this dessert. It is one of the best rendition i have discovered in the city. Warm, melt-in-your-mouth sticky rice, drenched in good quality coconut milk. It doesn't get much better. I enjoyed every spoonful with sweet fragrant mangoes. The ginger tea served at the end is knock your socks off perfect- a refreshing end to our heavy meal.